I was so excited when Jen asked me to write a guest post about how to get started shopping at Rite Aid. It was one of the very first stores I started doing coupon deals at and I slowly taught myself how to best maximize all their different savings programs. I can’t tell you enough how much Rite Aid has helped dramatically reduce our grocery budget. I will NEVER pay full price again for the majority of items we use in our household: cleaning supplies, diapers, toiletries, laundry detergent and so much more! I am passionate about sharing my Rite Aid knowledge with pretty much anyone who will listen. I just know that you can (and will) save so much money once you learn all the tips and tricks to shopping at Rite Aid. Their Public Relations department has done a really good job of listening to their shoppers and changing with the couponing trends, creating new and easy-to-use savings programs and releasing a VERY clear and concise coupon policy. If you think you are all alone in your coupon quest, I promise you, you’re not. I (and several others) do weekly Rite Aid match ups on our blogs to help you maximize your savings. I try to put together scenarios every week to give you ideas. You must have a Wellness+ card to receive the sale prices listed in the and to receive +UP Rewards. It is super easy to sign up and totally free. Sign up online here or in your local store. Make sure you swipe your card every time you shop. Your purchases are automatically tracked online and you will receive one point for every dollar you spend. When you reach 500 points, you will automatically receive 10% off all regular priced items; when you reach 1000 points, you will receive 20% off! You can also receive free health screenings and additional printable coupons sent to your inbox. These are coupons you earn by purchasing specific items or groups of items that can be used on your next transaction. They can be used towards any item in the store (with a few exclusions), much like a gift card. You do not have to have “filler” items like at Walgreens to use these coupons. As long as you don’t cut into the tax, you can use as many as you like in one transaction. They generally expire within two weeks of receiving them and you CAN use coupons to lower your out of pocket cost. * After +UP Reward, you were paid $1 to take toothpaste out of the store! At the beginning of each month, Rite Aid issues a rebate booklet with TONS of different products that qualify for rebates in varying amounts. In your weekly ad, you will notice items have an “SCR” savings amount listed. If you purchase an item that is $4.99 and there is a $2 SCR, you are only paying $2.99 after rebate. This program is super easy. Sign up online here. When you purchase qualifying items, all you have to do is submit a few pieces of information off your receipt and it is all electronically tracked. No mailing in receipts or cutting out UPC codes. At the end of each month, all your rebate items will be added together and you can request one rebate check. You can either cash these checks or use them to pay for your next purchase at Rite Aid. This used to be Rite Aid’s main savings program, but it looks like they are moving more and more towards the +UP Rewards. This is another great program from Rite Aid! You can sign up for a new Video Values account. All you have to do is watch short commercials/videos. For each video you watch, you earn credits plus get a coupon for the product shown. Once you hit 20 credits, you can print a “bonus coupon” for $4 off a $20 purchase. The coupons you receive are Rite Aid store coupons and can be stacked with manufacturer coupons. Rite Aid releases several of these coupons throughout the year, on top of the coupons that are available through Video Values. Their coupon policy clearly states that you only have to reach the total purchase amount ($20 or $25) BEFORE all coupons, so you can combine several “free after rebate” or high value +UP Rewards items to reach your total, then save an additional $5! When the stars align, these programs will overlap in a major way. Check out this deal idea (please note, this deal is not valid anymore, just an example). This was an actual scenario that ran a few weeks ago, so you can see how great Rite Aid can be. FREE after rebate and reward! I know this is a lot of information to take in. Start slow! I try to post scenarios every week that are easily accessible to everyone, with coupons that are readily available. Follow these scenarios for your first few trips, just to become comfortable. Then you can use them as a jumping-off point for your own ideas. Print out the Rite Aid coupon policy and keep it with you when you shop. Don’t hesitate to ask for help if you have questions! Drastically cutting your household budget is 100% possible, it just takes a little shift in your thinking. Good luck! Melody is a wife and mother of two unbelievably sweet boys under three, living in the Northwest. The only reason she has been able to stay home with her kids is by shopping for deals, hunting for bargains and using coupons for everything! She has really been able to stretch her family’s budget, so they can live comfortably on less. Make sure to head over to This Beautiful Frugal Life, where Melody features ways to save each week at the grocery & drug stores, as well as frugal entertainment ideas, inexpensive gift ideas & much more. Melody is a local blogger living in Eastern Washington. Can you combine UP Rewards on a purchase?? For example……If the ad says you can buy 2 bags of candy 2 for $5 then you receive a $1 UP Reward…….can I buy 6 bags of candy in one transaction and receive $3 in UP Rewards, or do I have to purchase them in separate transactions? Nikki – Generally, the ads say limit one offer per household, so technically, only one +UP Reward should print. However, for the past several weeks, all the offers have been printing multiple coupons, whether in the same transaction or separate. I don’t count on multiples printing, because if they don’t, you really have nothing to argue since the ad says limit one. I try to plan my scenarios as if I will only get one, then the additional rewards that print are a bonus. For example, this week, the Crest toothpaste was free after +UP Reward with a limit of one. I bought two in one transaction and got two rewards. A few days later, I bought a third toothpaste and a third reward printed. My total for this trip? $1.87 for 2 packs of diapers, a Starbucks Frappacino drink & some fruit cups!! This is why Rite Aid is one of my new favorite stores! I can’t believe what I paid for diapers with my oldest! I am saving a ton, just in diapers, with my younger son! That’s awesome Jen! Love the super-cheap diapers! I still have to do that this week! Oh Katrina, I am sorry you have so much trouble. I struggled with a few stores in our area for awhile, but luckily we have several to choose from so I was able to switch. Your +UP Rewards should always print, regardless of whether you paid with rewards or not. I hope this isn’t your cashier telling you otherwise. Have you ever tried contacting Rite AId corporate and discussing your problems with them? Is your store manager any help? Kim, Yes, it sounds like you did it right. Remember, you will pay more out of pocket, but then receive the +UP rewards to use on future transactions. This is basically lowering your total amt that you paid for the item, if you consider the +UP rewards in your total. 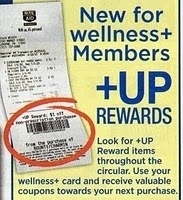 The +UP rewards are a coupon to use on anything on your next transaction at Rite Aid. I have a question. If there is a $5 UP reward for spending $20 on a certain type of product ( for example spend $20 on Neutrogena products get a $5 UP reward) is that $20 before manf. coupons or after? At this point, the $20 is before coupons.